An alternative to planted shelters, artificial shelters can be built quickly to protect horticultural crops and orchards from wind and easily moved to different locations. 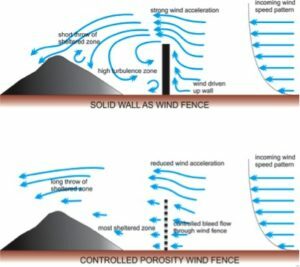 Wind causes erosion, transports unwanted dust and sprays, restricts plant growth and depletes moisture. Artificial shelters are constructed using tall posts and windbreak material, usually polyethylene fabric which is strung on a wire, and can also form a roof over the crop to protect it from hail and/or frost, contributing to a stable growing environment. These shelters may also serve as an interim measure until planted shelter becomes established. 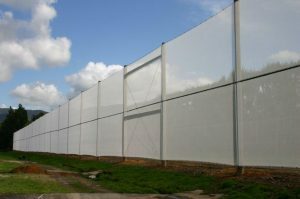 All shelter cloth comes with a 10-year warranty and UV protection, and the materials and design can be selected to suit the situation and crop needs. We can also dismantle artificial shelters and move them to another location for you, as well as providing maintenance. Artificial shelters can be used for horticulture, commercial properties, sports grounds and home use.